SCENARIO: we’ve all just watched Gonzaga prevail over Duke for the second time this season, beating them in Minneapolis 86-81 to win their very first championship. The Zags finish their season having not lost since their game in Chapel Hill against North Carolina (that was on December 15). 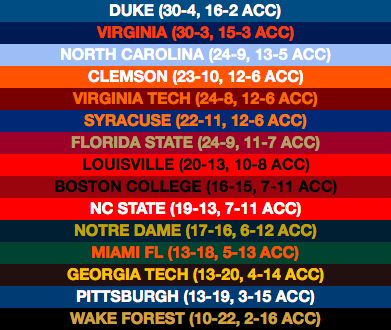 It was also a banner tournament for the ACC, who had three teams in the Final Four, but maybe not the ones you expected: Louisville and Virginia Tech are Final Four teams as well. Louisville in particular is a surprise, as they finished the season in a real slump, slipping all the way to a #9 seed. Virginia Tech makes it to Minneapolis as the #6 seed in the East Region, also a great accomplishment. – how does Louisville wind up a 9 seed? – how did Tennessee fall so hard? On to the conference reviews! The WCC is getting a writeup this time, since the Zags won it all. There’s nothing to talk about besides them, but they do exactly what they’ve been doing since WCC play started, and that’s win. 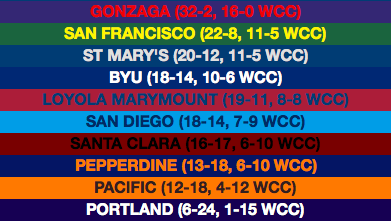 The biggest test left on their WCC schedule is the last regular season game, a visit to St Mary’s, and they walk out of the gym with a 33-point win. After a scare in the WCC tournament quarterfinal (a mere 7-point win over Pepperdine), Gonzaga sleepwalked to the conference championship. San Francisco’s at-large hopes are pretty much dead in our time, but they die for real when the Dons are upset by Santa Clara in their quarterfinal. Both Duke and Virginia lose just once more in the regular season – Duke hilariously losing the return matchup with Syracuse, getting swept by them, and Virginia shockingly losing to Notre Dame at home. That keeps the status quo between the two, seeing Duke win the conference’s regular season title. After convincing wins in the ACC tournament, the matchup of the star-studded week is undoubtedly Duke/Virginia III in the tournament’s final, and it’s Virginia that puts on a show, suffocating the Duke offense in a way they haven’t been able to do this season. Louisville has a really tough end to the season, as shown above, losing four more games in ACC play. A couple isn’t surprising since they still have to play Virginia twice, but they also lose to Syracuse and Boston College. Then, avenging their loss to BC in the 8-9 matchup of the conference tournament, they were plastered by Duke in the quarterfinal. If all that comes to pass, I think a 9 seed in the tournament would sound right, and that’s what happens. Time is a flat circle. Kansas, on a bit of an upswing here in mid-February having just beaten TCU IRL, parlays that into a Big XII regular season title, their 15th straight. The Jayhawks win out through the regular season, which is a bit of a surprise even though they’re expected to be favored in all but one of those games. I think Kansas is the only team in this conference that still has a prayer of getting a 1 seed, and that actually happens in this sim, even though they lose in the conference tournament semifinal. 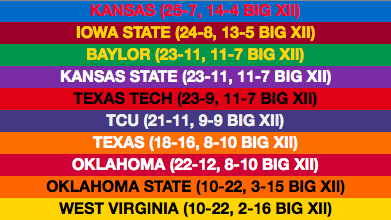 As we’ve come to expect from the Big XII, the top eight teams all make the tournament, and all are a 9 seed or better. Their surge starts out too late to actually make the tournament, but holy smokes, what an end to the season for Illinois! I think they actually would have made the tournament this time if they’d made a run in the Big Ten tournament, but they lost the 7-10 matchup to Minnesota. 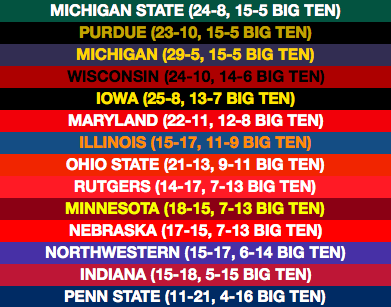 Still, after having a record of 6-15 overall at one point, the Illini won 9 of their last 10 regular season games, including the wins over Nebraska & Michigan State that have already happened, but also wins over Ohio State and Wisconsin in this sim. The top of the conference ends in a three-way tie. Michigan State picks up back-to-back losses to Ohio State and Rutgers to fall behind the eight-ball, but they make up for it by sweeping the rival Wolverines. Purdue surprisingly gets smacked around by rival Indiana in their upcoming game, and loses their final game to Northwestern. So, for the top 2 teams here, both lose games they’re not expected to lose, but make up for it in the end. As a person who likes to keep abreast of what’s going on around the bubble of the NCAA tournament, Memphis is barely even on my radar right now. 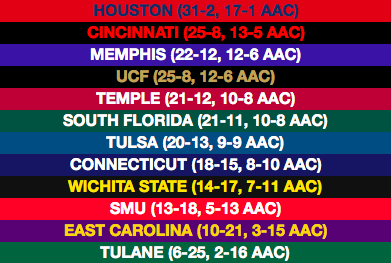 But here they are, winning all but one of their remaining games to finish third in the AAC, and actually getting into the tournament. That’s punctuated with a blowout of Cincinnati in the conference semifinal, their second win over the Bearcats in as many weeks. UCF, for their part, doesn’t have as tidy a narrative, but the Knights pick up a blowout of Cincinnati late in the season as well, and then beat Houston in the AAC tournament before winning the thing. A 6 seed might seem a little lofty in the grand scheme of things (BracketBot is higher on them than most, having them as a 10 seed in yesterday’s update), but it’s possible. 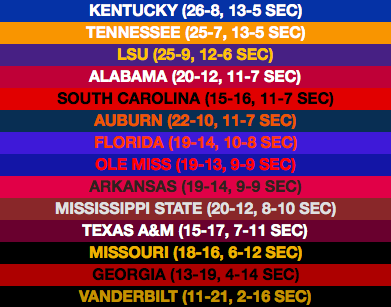 Whoa, SEC, are you OK? The Tennessee Vols still have the meat of their SEC schedule left in front of them, especially some very tough road games, and in this sim it goes pretty sour. Of Tennessee’s eight remaining games, a loss is plausible in six of them (South Carolina tonight & Vandy next week, both at home, seem like sure bets). Tennessee picks up five losses in those other six games – a sweep by Kentucky, and @ LSU, @ Ole Miss and @ Auburn. Only beating Mississippi State at home salvages a share of the regular season SEC title. Kentucky also has a rough go of it, losing three more games, including their game at Mizzou, and LSU loses five of their last seven too, only beating Tennessee and Vanderbilt. Kentucky still winds up with a 2 seed, but Tennessee has to settle for a 3. The teams on the bubble collectively hold their breath as Missouri makes a run to the conference semifinal, winning three games, but they’re handled by Kentucky. 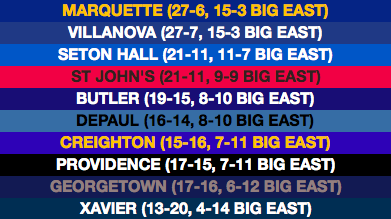 Not too much to say about the Big East. Marquette finishes the sweep of Villanova, winning the return trip to Philadelphia more easily than they did the game in Milwaukee. That hands them the tiebreaker for conference tournament time. The conference race was thrust into chaos late by the Seton Hall Pirates, whose last two games of the regular season are Marquette and Villanova at home – they won both here, certifying their NCAA tournament status. St John’s, at 9-9, is the very last team to make the NCAA tournament field. 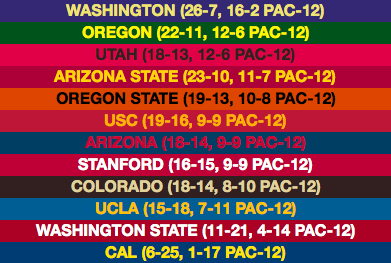 Not much to say here either – there’s not a lot of mystery left on the Pac-12 schedule. It’s basically coming down to “does Arizona State make the tournament”, which the Devils leave no doubt in doing by beating USC in the final. That came after a second win over Washington, so they were probably gonna get in anyway, so maybe it’d have been better for the conference if USC had come out on top, but ASU earns a safe 9 seed by winning the automatic bid. Nevada wins out through the regular season, and Buffalo and Wofford go one step further in winning every game from here to the tournament. It’s a testament to Buffalo’s season that it’s not at all weird to picture them as a #4 seed in the tournament, and that’s what they get. That’s also where Nevada lands after a pretty embarrassing loss to Colorado State in their Mountain West quarterfinal, and I can already picture a lot of internet chuds out there screaming that they shouldn’t make the tournament at all, but of course Nevada is still quite good. VCU is also a tournament team, having tied with Davidson for the A-10 title. The Rams lost to a fellow Rams team from Rhode Island in the A-10 tournament QF, but they survive as one of the last four teams in the tournament. In an all-West Coast final, the NIT championship game ends Oregon 67, St Mary’s 61. Nebraska and Notre Dame also reached the semifinals. A fun tournament overall, with more than 25% of games won by the team that would not have been favored. Thanks for reading if you’ve made it this far. Let me know if there’s anything else you’d like to see from these simulations – I’m still gonna do them as the season winds down, although it may take a little bit different form once the regular season ends. Hope to see you back here soon! There’ll be a new BracketBot update on Friday to head us into the weekend.